The Whitworth forensics team took first place in the overall sweepstakes and second place in the debate sweepstakes at the National Christian College Forensics Association (NCCFA) National Tournament. The tournament was hosted by John Brown University in Siloam Springs, Ark., March 9-11. Whitworth finished ahead of 24 Christian colleges from 14 states, including Azusa Pacific University, Liberty University, Wheaton College and Wiley College. The Whitworth team maintains a high level of success, having won 192 individual awards and 11 sweepstakes awards throughout seven tournaments this season. This is the second year of the re-born Whitworth Forensics Program after a 14-year hiatus, and this is the first time the team has won a sweepstakes award at every tournament in which it competed. Ingram was named Forensics Coach of the Year by the NCCFA in recognition of his effort in the restoration of the forensics program at Whitworth and for his team’s excellence in both speech and debate. 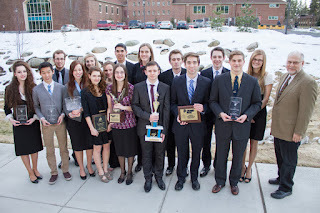 The Whitworth forensics team has one tournament left this season. The team will return to Arkansas for the International Public Debate Association National Tournament at the University of Arkansas-Monticello, March 22-24. 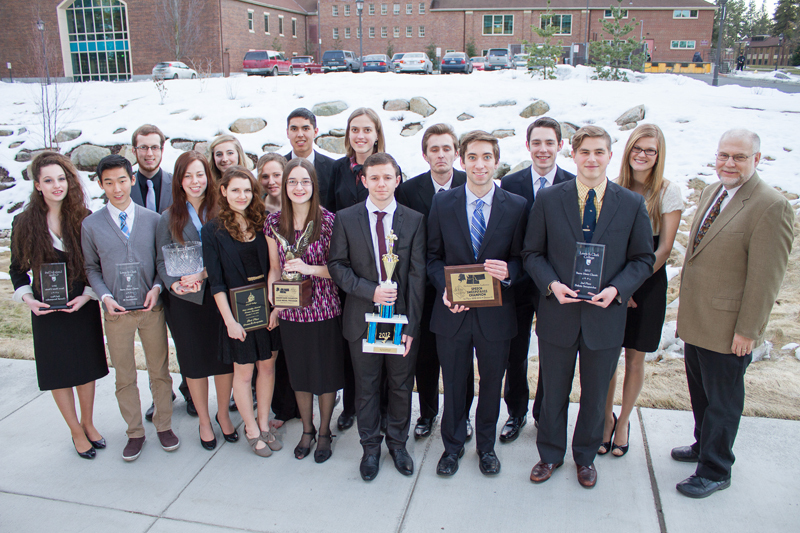 At the NCCFA national tournament, the Whitworth team brought home 15 individual speech and 10 individual debate awards; Whitworth also claimed three national speech championships -- by Jonathan Kim, ’15, Hannah Tweet, ’16, and Alex Hoffman, ’16-- and five national debate championships -- by Chris Burnett, '16, Sam Director, ’15, Matt Hancock, ’15, Jonathan Kim, ’15, and Bri Miller, ’15. Chris Burnett, ’16, took 4th place in novice extemporaneous speaking and 3rd in novice persuasion. Molly Daniels, ’16, took 5th place in novice prose. Lilly Davis, ’16, was a semifinalist (top 12) in novice impromptu speaking. Sam Director, ’15, was a semifinalist (top 12) in impromptu speaking. Madison Garner, ’16, took 6th place in novice persuasion. Alex Hoffmann took 1st place in novice persuasion and 4th in extemporaneous speaking. Jonathan Kim, ’15, took 1st place in informative speaking. Addy Koneval, ’16, took 2nd place in programmed oral interpretation and 6th in novice prose. Bri Miller, '15, took 4th place in novice persuasion. Brennan Neal, ’16, took 2nd place in novice informative speaking. Hannah Tweet, ’16, took 1st place in novice informative speaking and 7th place in novice prose. In the novice division Matt Hancock, '15, was a co-national champion. Brennan Neal, ’16, finished among the top four debaters. Norann Beidas, ’16, Lilly Davis, ’16 and Sarah Dice, ’16 were among the top eight debaters. The top four co-national champion debaters were Chris Burnett, '16, Sam Director, ’15, Jonathan Kim, ’15, and Bri Miller, '15. Madison Garner, '16, was among the top eight debaters. On Tuesday, April 2, the Whitworth forensics team will host the national debate champions of Ireland. This international debate exhibition will be held at 7 p.m. in Weyerhaeuser Hall’s Robinson Teaching Theatre. Whitworth will uphold the argument that “an education in the liberal arts is still important.” Call (509) 777-4739 for more information.